Private & peaceful golf course estate home in beautiful Kensington. 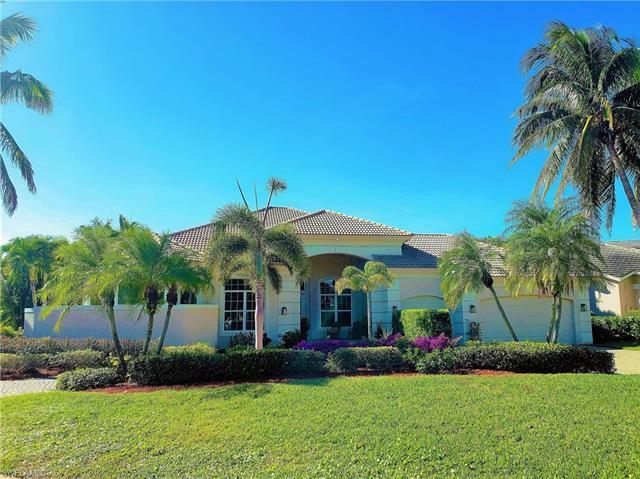 Outstanding views, custom heated pool with waterfall and spa, and open floor plan ideal for entertaining makes this your Naples Dream Home! Lush tropical landscaping provides privacy & serenity as you enjoy the masterfully designed living areas in this custom Rutenberg home. Gourmet kitchen with stainless steel appliances & granite counters. Seamless glass views from the family room, custom built-ins & wet bar. Formal living room & den with custom cherry wood built-ins. Gorgeous master suite with a spectacular walk thru shower & roman tub. All of the modern conveniences and touches are here: Under cabinet lighting, crown molding, beautiful light fixtures, and tray ceilingsâ¦ Freshly painted and new A/C installed. Kensington Golf & Country Club membership is optional, Kensington is one of the area's premier private clubs and offers dining, tennis, clubhouse and pool in addition to the world-class links.. Located just a short trip to 5th Avenue and downtown Naples, some of the most beautiful Beaches in the U.S., renowned shopping & easy access to I-75. Extraordinary value ... "must see" this home!